Standard Time® is primarily a time tracking product for client billing and project management, but it also has a complete resource allocation feature. And it also offers full employee availability for future tasks assigned to team members. You can search by skill-set, and assign tasks to under-allocated employees. Watch the resource allocation video. In the app, project tasks have the following fields that affect resource allocation. Download a copy now! Resources (users in the program) are allocated to tasks in the Project Task view. There, you can manage all the tasks and their assignments. After building a series of tasks for each project, choose View, Project Resource Allocation to view the resource allocation dialog. You will see a graphical bar chart that represents the time allocated to each resource. You can quickly see if a task is over-allocated, under-allocated, or correctly allocated. 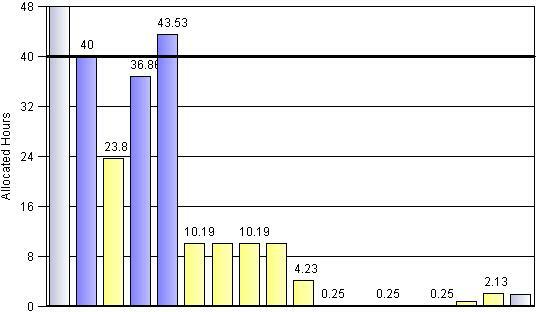 Blue bars represent correctly allocated time, while red and yellow bars represent over and under allocated time periods. Time periods are adjustable for Day, Week, Month, and Quarter. A single bar represents each time period. 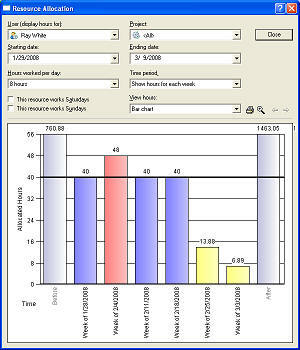 In addition to the bar chart, the resource allocation dialog provides two grid views. You can see time allocated in a task hierarchy, and time allocated to users in a resource hierarchy. The same information is presented, but in textual form.